Wilson Audio Duette II review | What Hi-Fi? Wilson’s original Duettes, launched back in 2006, were unusual high-end speakers. Not in terms of engineering or technology (though they were interesting in both respects) but because the company’s engineers took a refreshingly pragmatic approach to speaker placement. Almost every high-end speaker we review has been designed for free space use – that’s out into the room, well away from all walls. It’s an ideal arrangement in theory, minimising the unevenness caused by room effects, but not very practical for many people. Wilson’s answer was the original Duette. Priced at just over £9000 back in 2008, these speakers were designed to sound at home pretty much anywhere: on a shelf, back to a wall, even on their side if you wanted to. They could also be used conventionally in free space. All the user had to do was swap some (supplied) crossover components, an easy task, and the Duettes worked. Brilliantly. So what do the second-generation Duettes bring, apart from a massive price increase? Funnily enough, they take away in some respects. Wilson Audio found Duette owners didn’t tend to use them in as wide a range of placements as they had been designed to work. Usually they were placed on a stand, up against a wall. Aware that making the speakers so flexible in the first place had limited outright performance, the company took the decision to engineer this new version for against-wall use only. While this Series 2 looks similar to the old ones, they have been thoroughly revised in almost every respect to constitute a proper alternative to the company’s floorstanders. If you want a free-space Wilson speaker you buy one of those floorstanders. Want something that works well close to a wall? Buy the Duettes. The price rise reflects, it must be said, the upgrade in performance. Wilson has always been secretive about the materials it uses in its cabinets, and the main part of this enclosure is made of ‘X’ material – a cellulose/phenolic resin – with the tweeter baffle using the company’s ‘S’ material (natural fibres also mixed with phenolic). The enclosure wall thicknesses have been increased in specific areas, and the structure is braced more extensively. The results should be a rigid, well damped structure, which bodes well. Now that the speakers are intended for vertical use only, the engineers have been able to slant the front baffle back around 10 degrees to help time-alignment between the mid/bass and tweeter. This approach offers gains in many areas including integration and stereo imaging. There is a large choice of finishes, with four standard options: Diamond Black, Dark Titanium, Desert Silver and Argento Silver. If none of these suit there are 12 upgrade finishes (add five per cent to the price) including exotic choices as Macadamia Metallic and Bugatti Blue. Still not happy? Then Wilson will match pretty much any colour you desire – just add 10 per cent to the overall price. At this level you’d expect flawless build and finish, and that’s exactly what you get. While the Duettes' purposeful styling may not be to all tastes there aren’t any doubts about the way the company makes its products. The speakers are bolted onto their dedicated stands, which are designed with the aims of rigidity and low resonance. The stands are pricey at £2000, but should be considered essential to getting the Duettes performing well. The supports contain the crossover network and display some neat cable management too. The Duette’s drive units might not boast fashionable high-tech materials such as diamond or beryllium, but they are carefully engineered. The 25mm fabric dome tweeter has a special chamber behind it designed to absorb any rearward-radiated sound and make sure it’s not reflected back through the dome. The results should be purer, clearer highs. The mid/bass appears conventional by comparison: a chunky 20cm paper/pulp unit loaded by a rear-firing port. How do the Duette IIs sound? At first that question isn’t so easy to answer. These speakers are massively transparent to what the rest of the system is doing, and have a presentation that changes chameleon-like to mirror the electronics. If you ever hear these speakers and find yourself having doubts about their bass quality or tonal balance, take a look at the source and amplification. There’s a good chance what you’re hearing is the character of the electronics rather than the speakers. Use a suitably capable amp and source, things you like the sound of, and you won’t go wrong. During this test we used a range of amplification from our usual Bryston BP26/4B SST 2 pre/power and Gamut’s excellent D3i/D200i combination right down to Rega’s excellent little Elex-R integrated (just for fun) and got great results across the board. The speakers’ relatively high sensitivity of 92dB/W/m produces plenty of volume – even from relatively modestly powered amplification. Source components consisted of our reference Naim NDS/555PS streamer, Clearaudio Innovation Wood turntable package and Naim CDS3/555PS CD player. Give these speakers plenty of running-in time before serious listening. Our review samples sounded thin and bright initially, but settled to a satisfyingly even balance. We start with Orff’s Carmina Burana and are impressed straight away. There’s just so much detail here. Subtleties, the kind most speakers overlook, are easy to hear. They’re not masked by louder, more prominent musical strands either. We’re also taken by the Duettes’ breathtaking composure. Most speakers start to struggle when this piece really gets going, but these simply take it all in stride, delivering brutal dynamic swings with unerring control. There’s not even a hint of the speakers having to try hard. We’re impressed by the sound staging too. Usually, putting speakers right up against a wall results in a fairly limited sense of depth, but not here. The Wilsons’ set up a large stage coupled to a beautifully layered presentation. It extends well behind the plane of the speakers, which really is impressive. Putting a speaker close to a wall also tends to mess up bass evenness, but even here the Duettes do well. Low frequencies are articulate and balanced, something brought home when listening to Bob Marley’s Exodus. With this track the Wilsons deliver a powerful, taut bass that lacks for little when it comes to insight or articulation. 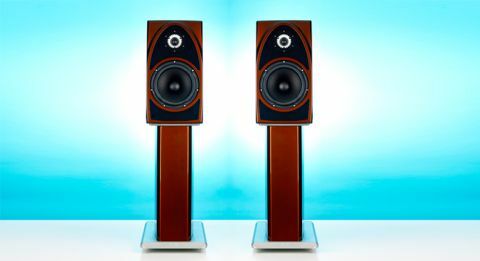 Sure, around £20,000 will buy you far bigger speakers that can dig even deeper into the lowest frequencies than these standmounters. But the Duettes do well enough in this area to not leave the listener wanting more. They sound balanced and even right across the frequency range. We love their midrange. Listening to Bjork’s It’s So Quiet is a real treat, the Wilson’s delivering her distinctive vocals with all the power, expression and agility we could wish for. There’s a wonderful sense of fluidity here and no hint of the clinical despite all the analysis on offer. It doesn’t matter what you listen to – these speakers lap it up. They can rock out with The Dead Weather’s 60 Feet Tall, delivering plenty of punch in the process, but are also able to change gear to render Arvo Pärt’s Tabula Rasa with all the finesse it deserves. These are the priciest standmounters we’ve ever tested, and for this kind of money you could buy superb alternatives from any number of rivals. Yet in anything other than an aircraft-hanger of a room we’d bet the Duettes would give a mighty fine account of themselves against all comers. Yes, they are expensive, but they’re excellent too.